Vivid family sunset beach portraits on Treasure Island Florida - Nikon D300 Nikkor 80-200mm @ f/4 ISO 200 1/250th Strobist: SB-800 to frame left & SB-600 to frame rightIt was great to see the Martineau Family again, who I first photographed back in the summer of 2010. They were once again visiting from Pennsylvania with their three children. We met at the same beach on Treasure Island, Sunset Beach, my favorite beach in all of Florida. This is a great place for family beach portraits, and also skimboarding! Pulling light from the sky long after the sun went down - Nikon D300 Tamron 17-50mm @ f/5.6 ISO 640 1/60th Strobist: SB-800 to left & SB-600 to rightI was looking forward to seeing how much the children had grown in the past two years. The most noticable growth was of course with their youngest, and the fact that he could now talk and his favorite words appear to be "alligator golf." Cartwheel sunset beach skills! - Nikon D300 Tamron 17-50mm @ f/5.6 ISO 200 1/60th Strobist: SB-800 to frame left & SB-600 to frame rightBeing a Thursday evening in late April Sunset Beach was mostly free of tourists and locals as well so we pretty much had the entire half-mile strip of beach to ourselves. The only passersby were some water birds. Family running on the beach having fun - Nikon D300 Nikkor 80-200mm @ f/4 ISO 500 1/500th natural lightLast time we made a very similar shot to the one above with the family running and laughing down the shoreline. The biggest difrerence this year was that it was a cloudless sky, whereas two years ago a storm was just upon to fall on the beach providing a dramatic cloudy sky for a background. Siblings having fun on the beach - Nikon D300 Tamron 17-50mm @ f/5.6 ISO 200 1/80th Strobist: SB-800 to left & SB-600 to rightThe cloudless sky helped me be able to make shots well after the sun went below the horizon and still pull some color out of the twilight sky. Family beach portrait watching the sunset - Nikon D300 Tamron 17-50mm @ f/5.6 ISO 200 1/100th Strobist: SB-800 to left SB-600 to rightI was very glad to be able to continue to be the Martineaus family photographer on their Florida visits and I look forward to their next visit! 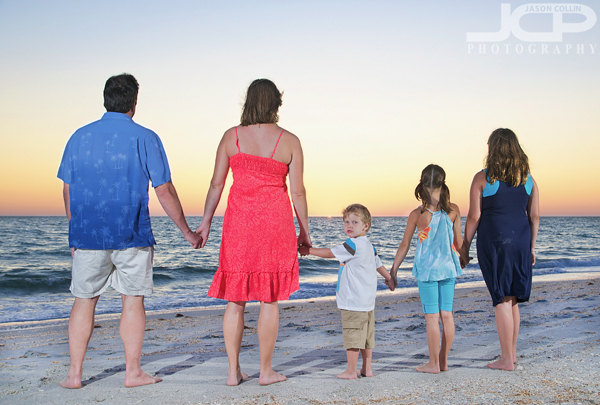 Reserve your family's Florida Beach Portrait session today!